Brad Atkins, former Navy Petty Officer Third Class, says goodbye to his daughter, Carmen, on May 24 in Columbia, Mo. Atkins traveled to Moore, Okla., to provide relief efforts as part of Team Rubicon. COLUMBIA, Mo. – From May 24 to May 30, seven Veterans United Home Loans employees who are military veterans were in Moore, Okla., to assist in disaster relief as part of Team Rubicon's Operation Starting Gun. Team Rubicon is a nationally recognized nonprofit made up of U.S. military veterans and medical personnel specialized in deploying to disaster zones. "The whole situation was devastating," said former Marine Corps Sgt. 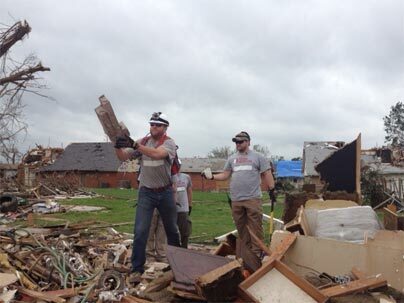 Jon Pharr, Veterans United employee and previous Team Rubicon volunteer following the Joplin, Mo., tornado in 2011. "But, when you're there, with boots on the ground, making a difference, seeing the residents impacted and hearing their stories, it just makes you feel better knowing you are helping them." In addition to Pharr, other Veterans United employees who traveled with Team Rubicon included Brad Atkins, former Navy Petty Officer Third Class; James Bowe, retired Army First Sergeant; Delano Lenyard, former Army Sergeant; Levi Newman, former Army Sergeant and member of Team Rubicon's regional advisory board; Terry Roberts, former Marine Corps Staff Sergeant; and Major Craig Swank, Missouri Army National Guard. "After we got back from Moore, I couldn't help but continue to think about how much more still needs to be done," Newman said. "We met so many great people there, and I was proud to be with Team Rubicon and my co-workers providing much needed assistance." Terry Roberts, former Marine Corps Staff Sergeant, and Levi Newman, former Army Sergeant and member of the Team Rubicon's regional advisory board, help to clear debris left by the destructive EF5 tornado in Moore, Okla.
Veterans United's Oklahoma branch in Lawton is about one hour from Moore. The company's charitable arm, Veterans United Foundation, pledged $25,000 to American Red Cross and $25,000 to Team Rubicon to aid in relief efforts. "We were proud and excited to have donated to both of these amazing organizations," said Megan Sievers, director of Veterans United Foundation. "This is exactly what our foundation is for and it is why our employees pledge." The EF5 tornado struck Oklahoma on May 20. The clean-up and relief efforts are ongoing. Those interested in helping the relief efforts may donate to American Red Cross or Team Rubicon.